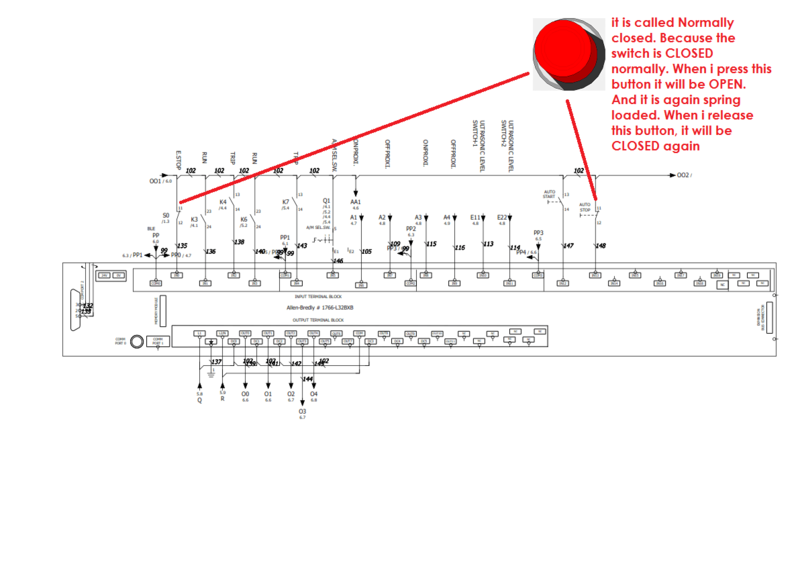 In this Article we are going to learn about – How to wire a PLC or PLC Wiring! 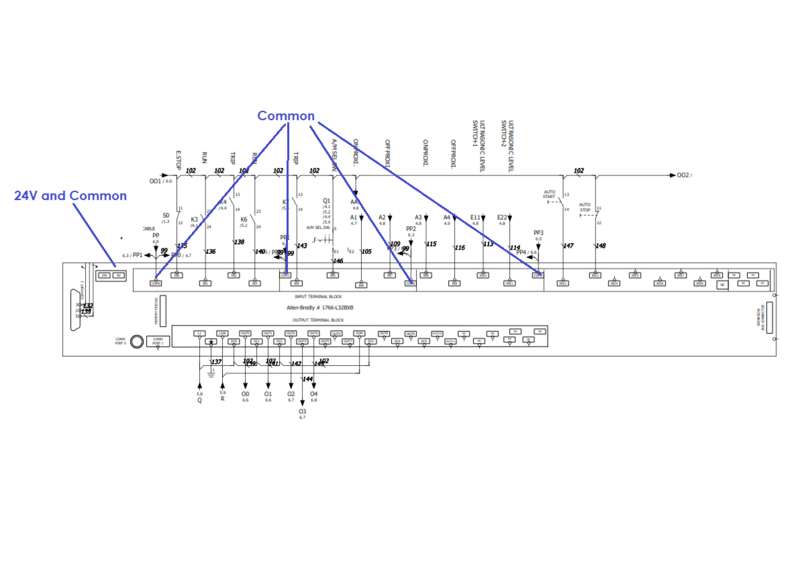 Now when we are going to install a PLC, in any panel or any machine, or in any process,First we have to wire up that. So we will understand that, how to wire a PLC. Which wire is to be connected where? 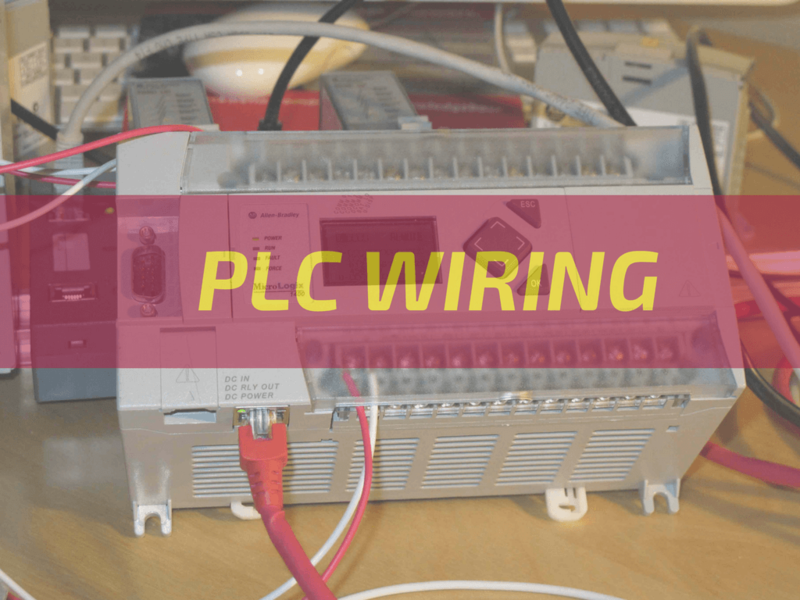 So very quickly, lets understand the basic components of PLC. In front of the screen you can see ‘This is a PLC’ by the company ALLEN BREDLY PLC.We have some Input terminals.Now these are the terminals onto which we will connecting the Inputs. What are the Inputs ? Now what are the inputs? Inputs can be switch, it can be sensors, it can be limit switches, it can be any source of input signal (sensor) Then we have the output terminals.These are the Output terminals..onto which we will be connecting the outputs. Now what output or what input can be in any machine depending on the various processes. Suppose we are going in a lift. Now what you do – You push a button! The button is your Input. That buttons tells the machine, tells the process or tells the lift, which floor you want to get into. So that movement of the lift is done with the motor. And that is your output. 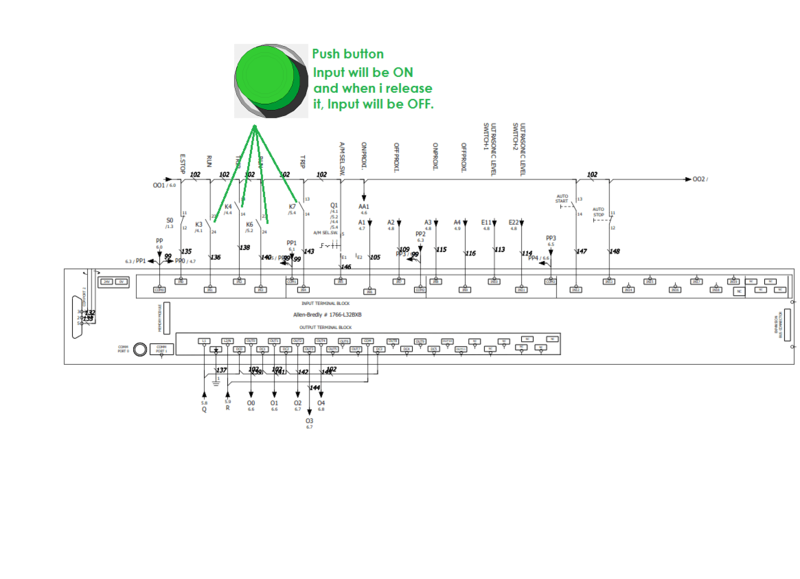 So you understand that the button is the input which will be connected to the input terminals and the motor will be connected to the output terminals. But what happens inside that! That is the program. How the controller has been programmed? In a similar way we will program this PLC using this ‘Programming Cable’ – That’s the programming cable! We have to make the program in the computer, then we have to download that in to this PLC. Which will remain stored in that. So that’s what all about Programmable Logic Controller. 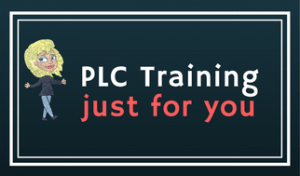 That’s what PLC stands for! Programmable Logic Controller. A Controller which can be programmed using various Logics. we are not use only PLC Wiring!! Logic is also required for operation or process. Logics can be If-else, OR, NAND, NOT.. so that’s the logic which we are using in ourtday to day life. The similar logic we can program in a PLC.OK let’s see further components! We have RS232 terminal over here. Now this terminal is used to connect this PLC to an HMI or any other communication source. So that we can communicate what’s happening inside the PLC.Then we have D-A Card. This is Digital to Analog Card, which converts digital data into Analog signals. In this case, digital data can be binary bits. These binary bits can be converted into analog voltage which can be further used to drive different analogue outputs. Then we have A/D card which is Analog to digital converter, which convert analogue to digital signals Now analogue signals can be given by analog sensors. Now if you are from Instrumentation,electronics or Electrical background! So you can understand, there are two basics control signals – which is – V and – mA. So there are sensors which gives these control signals.So that signals needs to be processed.To process those signals we have to convert that into Digital form, which makes the processing very easy. That’s why we convert analogue signal to digital using this card. So these are the basic elements you will find in many different companies of PLC. this PLC is not needed to connect to Power sources.This will be connected (powered) internally by the software. But we have to provide the voltage to drive the Inputs. So let’s understand how this input will be RUN. How they will indicate that there is some voltage or there is some physical activity outside this PLC. So you can see COMMON terminal here. Now i am going to connect this 0V(-V) to this COMMON. Like this ! So my 0V has been connected to COMMON. Now we have to understand that -v(0V) We need to create a potential difference of +V(24V) across these input terminals. Then only this PLC will recognize that there is some input. For example, if i connect this V over here (IN ). And then i am going to simulate that. You will see this is ON. This is ON because this V and V. V is connected internally to this Input (IN ). So we have created a Potential difference of V.
Now in many PLC’s instead of V you may find Line and Neutral, because that depends on the manufacturer, whether he is providing VDC inputs or whether he is providing AC Inputs. In some PLC, you may find instead of V and V – it is written Live and Neutral. This was my Micrologix 1400 input card.I am going to connect some input switches here. Now this is my push button. Let’s take it x . Now i have connected this to IN . And again i need some power sources. Let’s take V. OK, so what happen if i don’t connect V over here? Nothing gonna happen! It’s not going to get ON, because there is no potential difference, there is nothing at the common end. So we have to connect V as well. Ok, so now i have connected a switch. What happen, this is a normally push button which is spring loaded. When i press this switch, Input will be ON and when i release it, Input will be OFF. So this is an Input switch. 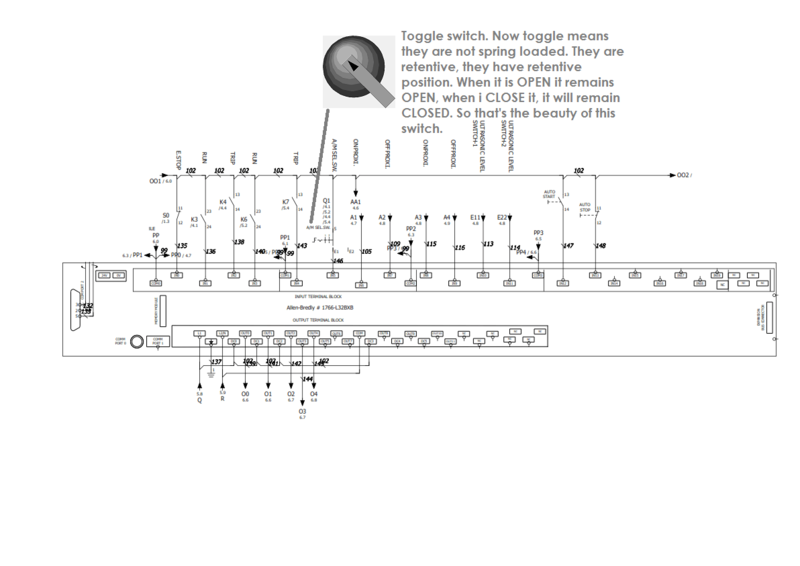 You may find such kind of switches in your panel in some other machines. You may find some green button. So this button is connected in this way. This is connected to some input and COMMON is connected to V. So similarly, let’s connect some other switches. This is my normally closed button (switch). As it’s symbol indicates, that it is passing the signal in normal position. That is why it is called Normally closed. Because the switch is CLOSED normally. When i press this button it will be OPEN. And it is again spring loaded. When i release this button, it will be CLOSED again. And this is Normally Open, Normally Open means when i am not pressing this button, the circuit will be OPEN. When i press this button, it will be CLOSED. So these are the different types of switches, which we can find in the inputs. Now let’s have a toggle switch. Let’s name it x . It’s connected to IN and again this to here. Some more input buttons. These are again Normally Open Toggle switch. Now toggle means they are not spring loaded. They are retentive, they have retentive position. When it is OPEN it remains OPEN, when i CLOSE it, it will remain CLOSED. So that’s the beauty of this switch. So i have connected switches. So i hope you have understood that .. that this is ON because we have V already across this terminal (IN ). This will be ON, when i press this button. And again similarly with these cases. So this in my input section. How we are getting the input from the outer world and how PLC is judging the inputs just by this voltage! Again where we are going to have potential difference, that input will be ON. So this was about the Input card of PLC or we can say input terminals of the PLC. Now let’S see what happens at the Output terminals. For that i am going to have Output card from here.You can see like this. So i am placing this output card little bit away from input card to make the concept pretty easy. Similarly we have different outputs – OUT 0, 1, 2, 3, 4 and then we have a COMMON. So similarly i am going to connect V, i can take the wire from here to this COMMON terminal. Now here i will be connecting the output components. Not the switches,. but the output components. So let’s see what we have in output components. We have Coils, LED Display, Coil Unlatch, Latch, Solenoid, Indicators..to maintain the potential difference. Now what happen here is, Now when i simulate that,This V is travelling to the one end and another end is not connected to the V. Why, because! in this case, it was already connected here. But in this case, it is not connected! And this will be connected only after when we will be do the programming. It won’t RUN when i press this button, or when i press this button or this button. But how it will RUN that depends upon the program. So this is my output not running right now. Let’s add some more outputs here. Let’s call it y . So i have connected two outputs now and both are not running, because i have not program the PLC. What does a program do? Program will link this Input section with the output section. Suppose i want, by pressing this button this first light should be ON, i have to make the program according to that. If i want, after pressing this one, i want both outputs should be ON, again i have to change the program. I don’t have to change the wiring. I just have to change the program. Similarly if i want, by pressing this button, both should be ON. I have to change the program only. Wiring is one time. Remember this! So this is all about the wiring! How we have to wire the input section, how we have to wire the output section ? We can similarly connect some more inputs, we can connect some more outputs. Like this..
We are going to see how to do the programming, that’s based on simple logics -OR, AND, NOT, IF, ELSE, TIMERS, COUNTERS. So that’s very interesting. Stay tuned,and if you have any doubts, kindly post.if you have any doubts, i will clear it out. So this was all about the wiring.